Checks can be used to search PDF files for specific factors, and Fixups allow you to alter files in line with specific criteria. 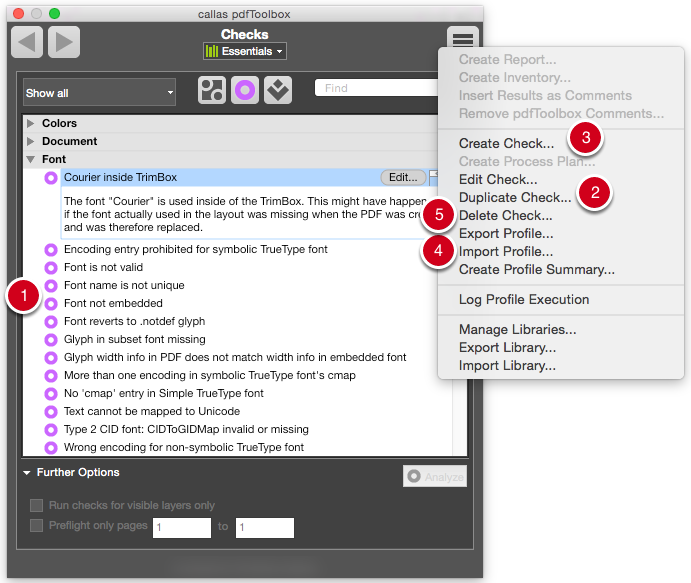 Profiles are designed to link Checks and Fixups together. Process plans can be used to ensure that multiple Profiles, Checks or Fixups run one after another in a controlled fashion. Finally, Libraries enable users to bring all pre-specified categories together into personalized collections for a better overview. 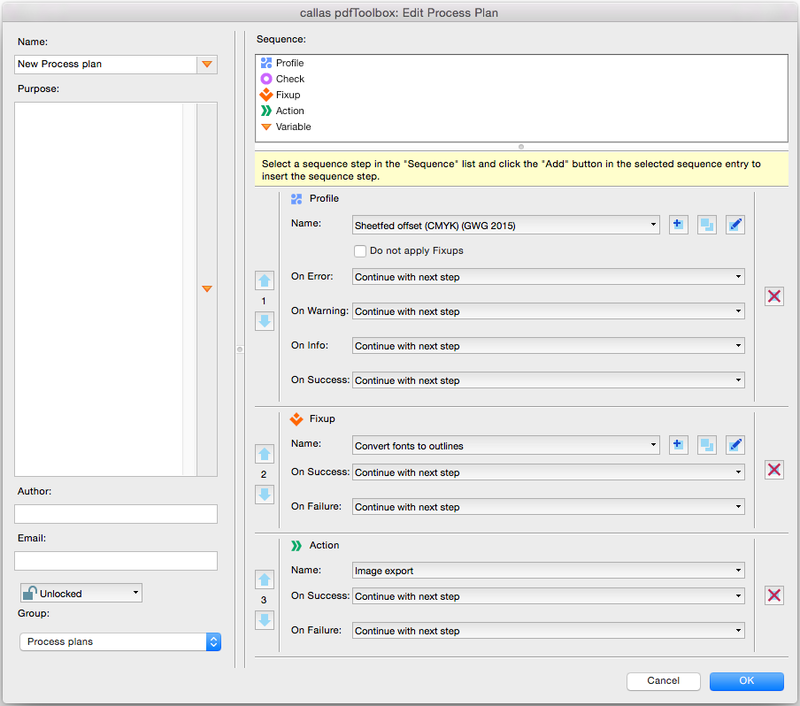 Checks can be used to test PDF files for specific parameters. Checks inspect PDF documents, but do not alter them. A number of different Checks are supplied as standard. Clicking on an entry in the list containing the Checks will provide a short description of the relevant check parameters (1). If custom Checks are needed, users can create their own check Profiles. These can be altered versions of existing Checks - in which case you can work with duplicates (2) - or new Checks can be created from scratch (3). Checks can also be exported and imported (4). This may be of interest if you need to forward or distribute them within your organization, or if you work with external partners. Users can also delete Checks (5). Fixups can be used to alter PDF files. From a technical perspective, a fixup is always preceded by a check which tests the PDF file for specific parameters which must exist in order to trigger the check in the first place. A number of different Fixups are supplied as standard. Clicking on an entry in the list containing the Fixups will provide a short description of the parameters that will be corrected in each case (1). If custom Fixups are needed, users can create their own fixup Profiles. These can be altered versions of existing Fixups - in which case you can work with duplicates (2) - or new Fixups can be created from scratch (3). Fixups can also be exported and imported for forwarding or distribution within your organization or with external partners (4). Users can also delete Fixups (5). 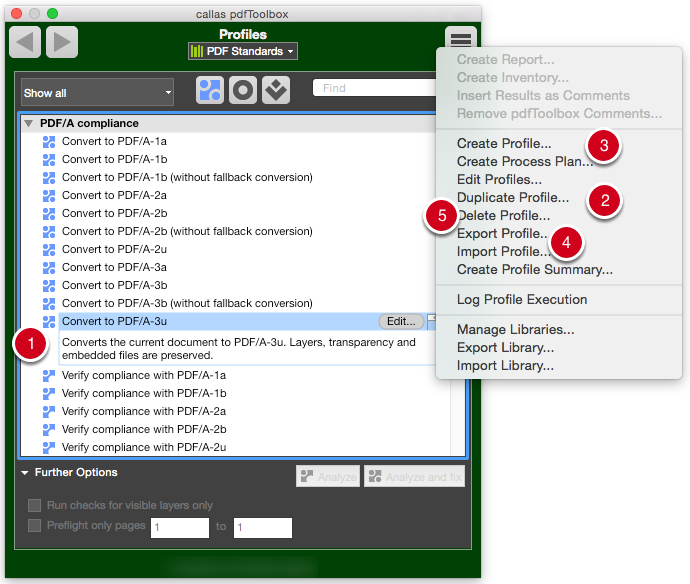 Profiles can be used to check and/or fix PDF files. For example, Profiles are used to test the various PDF standards and fix files as necessary. A number of different Profiles are supplied as standard. Clicking on an entry in the list containing the Profiles will provide a short description of the relevant details (1). If custom tasks are needed, users can create their own Profiles. These can be altered versions of existing Profiles - in which case you can work with duplicates (2) - or new Profiles can be created from scratch (3). Profiles can also be exported and imported for forwarding or distribution within your organization or with external partners (4). Users can also delete Profiles (5). Process plans allow you to organize steps in interrelated sequences. Parameters can be drawn from five different fields for the sequence steps. The steps can process conditional instructions (if..., then...). Examples of results that occur when specified parameters result in a given report include Success, Warning, Error and Info. This allows you to assemble processes which make use of conditional switches at specified points in the process. Prefer a video introduction? Watch the libraries in pdfToolbox movie. Libraries let you organize sets of Profiles, Checks, Fixups, switchboard actions, output conditions and imposition configurations. Libraries offer a broader overview for users who, for example, wish to create pdfToolbox environments for a range of jobs or for multiple customers. 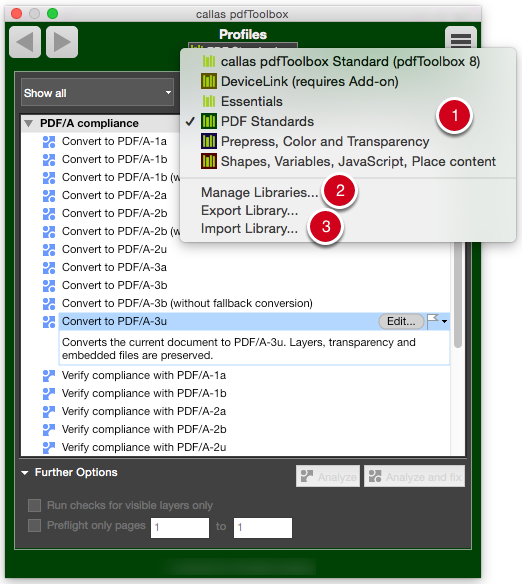 pdfToolbox is supplied with a range of preconfigured Libraries (1). In the Switchboard, and in the overview of Profiles, Checks and Fixups, users can open the desired library from the pop-up menu. 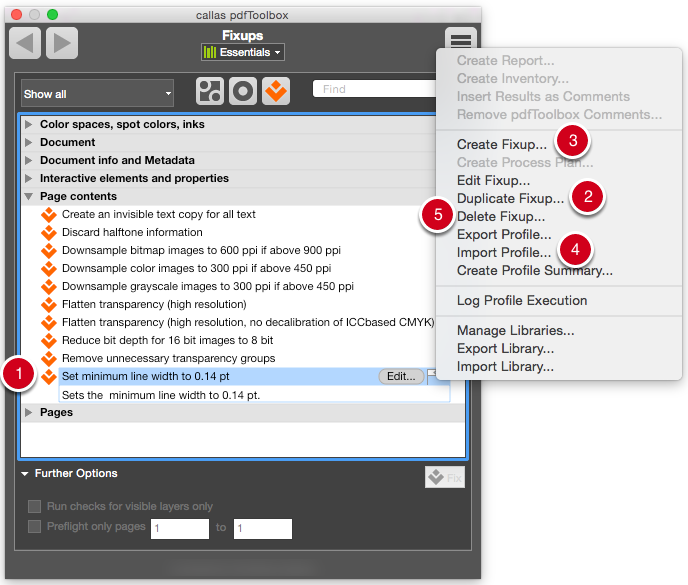 Libraries can be edited (by clicking Manage (2)), exported and imported (3). All other information relating to Libraries can be found in the chapter Libraries - Overview.